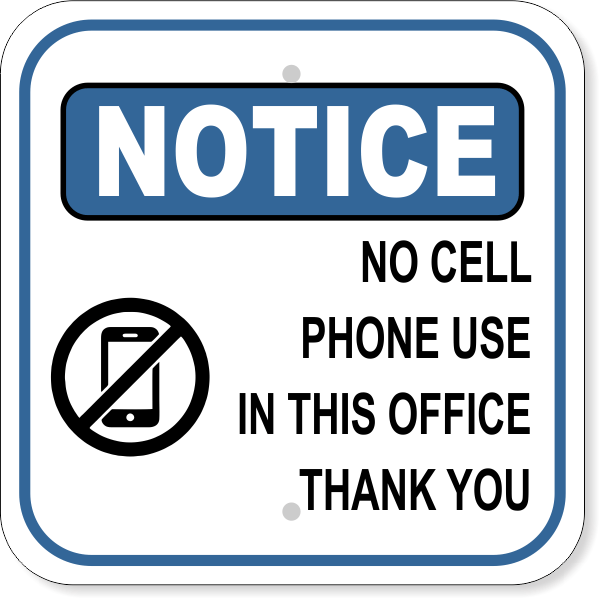 Encourage your customers to complete their phone calls before stepping up to your reception desk with this No Cell Phone Use in this Office Notice Sign. Saves time for your employee & your customers. Businesses are becoming less tolerant of people using their cell phones while trying to conduct business. Employees at these businesses want your attention when they are trying to help you. Our No Cell Phone Use in this Office Notice Sign will make an effort to tell your patrons to finish up their phone calls before conducting business with you. This sign is printed on vinyl and mounted to heavy duty .063 aluminum. Two pre-drilled holes are at the top & bottom for easy installation. Aluminum has 1.25” radius corners to protect you from sharp edges and gives a professional finished appearance. For longer life of your printed sign, add lamination for a few dollars more. Lamination helps protect from UV rays to extend the life of your sign and is recommended for outdoor signage. For indoor use, the vinyl print & aluminum will last for several years. Order this No Cell Phone Use in this Office Notice Sign today. Most orders ship the next day!